FLICK on the 14 inch television, connect your Vic 20 and get booted up! What would you like to play? Take your pick – Supervaders, Bomber Run, Cosmic Cruncher, Hoppit, Hunchback, Pit, Emmet Attack, Space Invaders, Pacman? How about Hunchback? Slide the cassette into the cassette reader and get that game loaded! The message ‘searching’ appears on the screen as the mighty Vic 20 seeks out the program on the cassette. ‘Found Hunchback’ …loading’. Soon you’ll be swaying and jumping whilst attempting to rescue the beautiful lady. 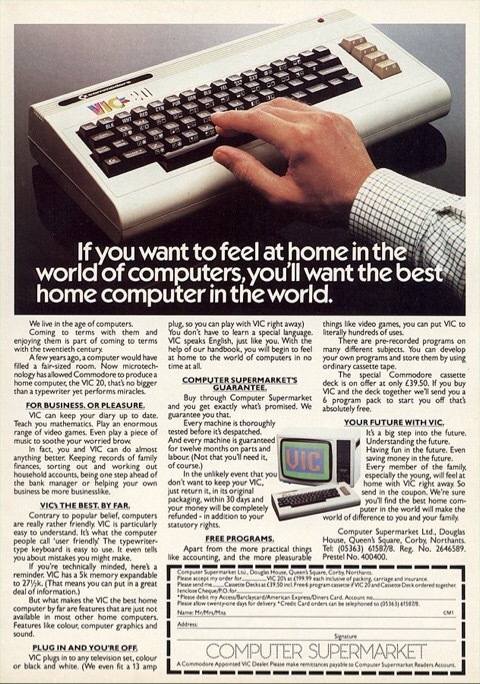 The Vic 20 was bold and proud. It had a limited amount of available memory but who cared? If you wanted to boost the memory then you could splash out on a RAM expansion. Additional RAM meant the Vic 20 was able to handle more complex games. Ever tried to load a game in the cassette reader when suddenly the dreaded error message appeared on the screen? It’s then a case of re-booting and trying again. Repeat the process until successful. Maybe you’ve had a go at computer programming and spent most of the day typing in a programme from the user manual. There’s only one word to describe this task – Painful! Once you’ve spent most of the day typing the programme there is no guarantee that it will work. I remember spending a whole day typing in a gaming programme called Killer Comet. After sorting through all the typing errors, I watched in anticipation to see what would appear on the screen. My 8 hours of programming and correcting resulted in a large white rectangle flashing across the screen from left to right. So much pain for a flashing rectangle! Today the Vic 20 has serious nostalgic status. If you want one you can bag one on eBay. It was one of the earliest, affordable home computers. Looking back, the graphics were seriously pixelated but was a huge improvement compared to the earlier consoles. I loved the Vic 20 – I’d play games until the early hours of the morning. The Vic 20 is gone but not forgotten. A nostalgic recollection and collection of blogs featuring a fun and factual look back at British advertising, leisure and entertainment from the yester-years are featured in the new hardback book, Section N Underpass. Release date November 2018.